Understanding and measuring forest resistance and resilience have emerged as key priorities in ecology and management, particularly to maintain forest functioning. The analysis of the factors involved in a forest’s ability to cope with disturbances is key in identifying forest vulnerability to environmental change. In this study, we apply a procedure based on combining pathway analyses of forest composition and structure with quantitative indices of resistance and resilience to disturbances. We applied our approach to boreal forests affected by a major spruce budworm outbreak in the province of Quebec (Canada). We aimed to identify the main patterns of forest dynamics and the environmental factors affecting these responses. To achieve this goal, we developed quantitative metrics of resistance and resilience. We then compared forests with different pre-disturbance conditions and explored the factors influencing their recovery following disturbance. We found that post-outbreak forest dynamics are determined by distinct resistance and resilience patterns according to dominant species and stand composition and structure. Black spruce forests are highly resistant to spruce budworm outbreaks, but this resistance is conditioned by the length of the defoliation period, with long outbreaks having the potential to lead the system to collapse. In contrast, balsam fir forests easily change to a different composition after outbreaks but are highly resilient when mixed with hardwood species. Overall, the severity of the disturbance and the tree species affected are the main drivers contributing to boreal forest resistance and resilience. Our procedure is valuable to understand post-disturbance dynamics of a broad range of communities and to guide management strategies focused on enhancing the resistance and resilience of the system. LC conceived the ideas; AL and MSP designed methodology; MSP analyzed the data and led the writing of the manuscript. All authors interpreted results, contributed critically to the drafts and gave final approval for publication. The online version of this article ( https://doi.org/10.1007/s10021-019-00378-6) contains supplementary material, which is available to authorized users. This study was funded by MINECO via EST_RES Project (AGL2015-70425-R) and BIOCLIM (CGL2015-6741R) and the EC through the Marie Curie IRSES Project NEWFORESTS (PIRSES-GA-2013-612645) and the ERA-NET Foresterra Project INFORMED (Grant Number: 29183). MINECO provided MSP with support through a predoctoral contract (BES-2013-063019) and AA through a Juan de la Cierva fellowship (FJCI-2014-20739). We thank Mélanie Desrochers and Aurélie Terrier for technical support and three anonymous reviewers for constructive comments on the manuscript. The data used in this study are publicly available on the Données Québec webpage (https://www.donneesquebec.ca/fr/). De Cáceres M, Font X, Oliva F. 2010. The management of vegetation classifications with fuzzy clustering. J Veg Sci. http://sites.google.com/site/miqueldecaceres/. Ministère des Forêts de la Faune et des Parcs. 2016. Données sur les perturbations naturelles – insecte: tordeuse des bourgeons de l’épinette. Jeu de données, version shapefile. https://www.donneesquebec.ca/recherche/fr/dataset/donnees-sur-les-perturbations-naturelles-insecte-tordeuse-des-bourgeons-de-lepinette. 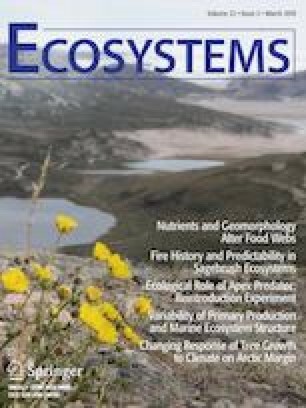 Oksanen J, Blanchet FG, Friendly M, Kindt R, Legendre P, McGlinn D, Minchin PR, O’Hara RB, Simpson GL, Solymos P, Stevens MHH, Szoecs E, Wagner H. 2017. vegan: Community Ecology Package.:1–292. https://cran.r-project.org/package=vegan. R Core Team. 2017. R: A language and environment for statistical computing. http://www.r-project.org/.